Butler Lane is Melbourne’s newest warehouse venue. This chic industrial warehouse located in the heart of Richmond has been architecturally designed to capture the natural light and features modern finishes including high ceilings, exposed beams, polished concrete floors & red brick walls. The expansive open plan warehouse leads to a charming courtyard with a tall living wall – the perfect place for pre dinner cocktails or informal entertaining under the stars. Perfect for corporate events, special occasions, private celebrations, wedding receptions and more, Butler Lane can easily cater to a casual cocktail party for 250 to a formal sit-down wedding banquet for 160 guests. 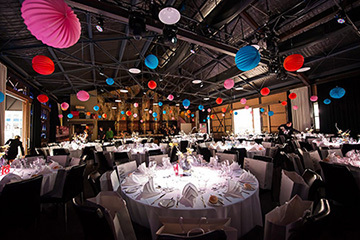 This venue is exclusively catered by Melbourne’s pre-eminent catering company, Peter Rowland. The team will expertly guide you through menu, drinks and stylings decisions to ensure your event goes off without a hitch. This desirable inner city warehouse is a blank canvas for you to create a custom and memorable event your guests will remember.